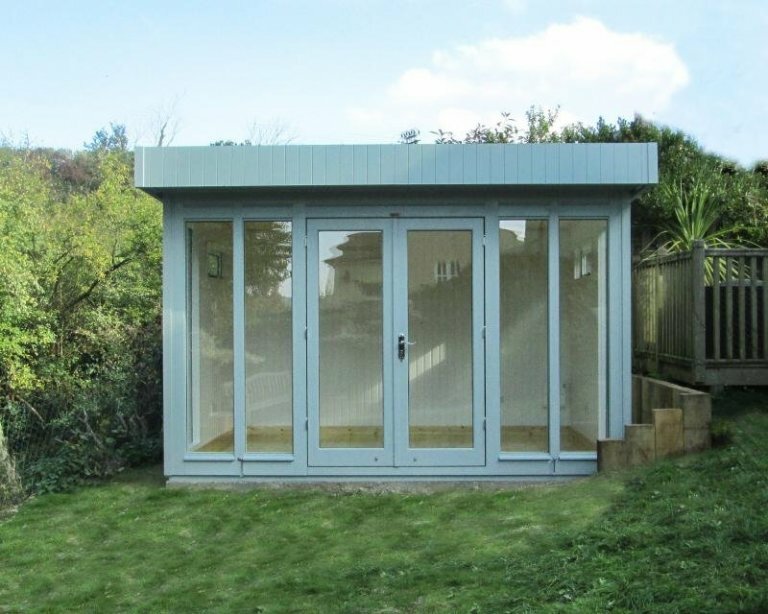 This 2.4 x 3.6m Salthouse Studio has been installed in our customer’s garden in Tregony, Cornwall to use as a garden retreat for the customer to read, sew, relax or entertain in, whatever takes their fancy. To have some light outside their building in the evenings, the customer asked if we could provide them with external lights, so we were able to source polished chrome canopy lights that fit under the roof overhang that the customer was very happy with. 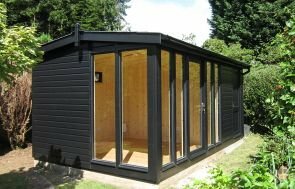 Our Garden Studios can all be used through the year, as they come with double glazing, matchboard lining, and full insulation as standard. To help further with this, the customer also chose to have an electric pack, which comes with internal lights, plug sockets, an external socket, a light switch and a consumer unit. Other internal features include painted matchboard lining, and a Natural lacquer on the floor. For the external features, the customer chose heavy duty felt to protect their roof with, white guttering was fitted to the back wall to help catch excess rainfall running from the roof, and the Studio has been painted in the colour Verdigris from our Valtti Paint Range. 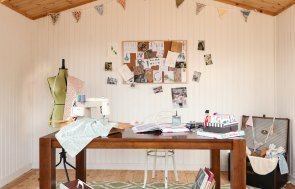 For more information on our range of Garden Studios, Summerhouses or Garden Rooms, all of which can be made to be year-round use buildings, please call us on 01760 444229, or come and visit us at one of our Show Centres across the country.